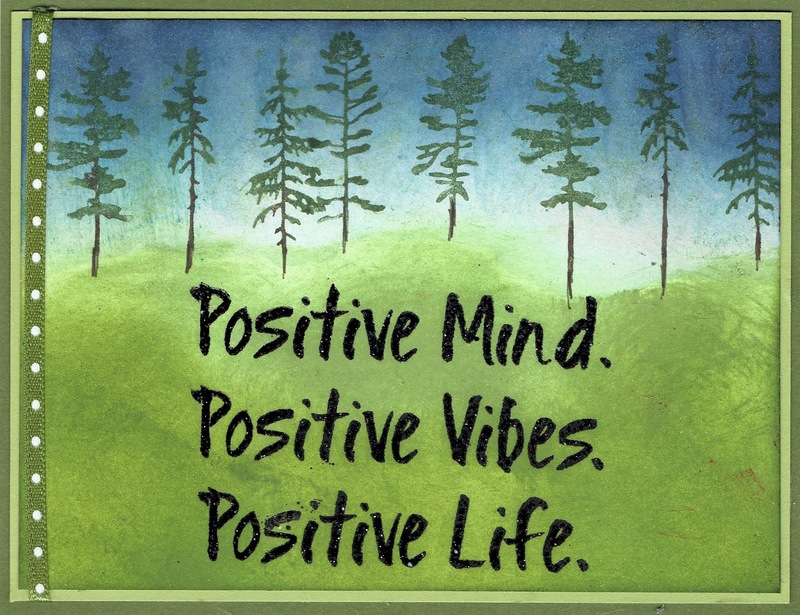 This is a July Release Technique Junkies Stamp called Positive Mind - http://techniquejunkies.com/positive-mind/. 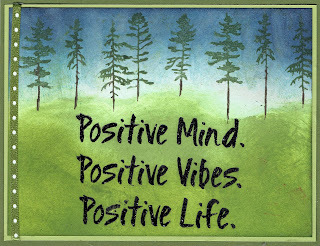 I tried to think of what would picture this emotion of a positive mind. I decided that nature would do that. So I used the Technique Junkies Creaking Trees stamp (http://techniquejunkies.com/creaking-trees/) without the words at the top. I used markers to color the trees directly on the stamp being careful to not add color to the words. Then I tore a long post-it note for the grass and the sky line. I sponged in color for both. Layers and card stock and a ribbon finish the card. Tomorrow is the big reveal for the August stamps! Be ready to Blog Hop! Remember that if you use the code below for any thing (except during the first 8 days after a release) you can get 10% off your order. I really like this flirty hummingbird image! It was a June Technique Junkies release called Watercolor Hummingbird- http://techniquejunkies.com/watercolor-hummingbird/. 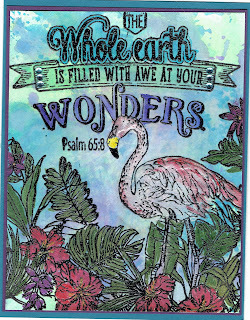 I used the Nuvo Glitter markers on the outside lines of the image. I used Twinkling H2Os to watercolor the body of the hummingbird. I sponged around the bird for the sky. I stamped the verse from Things I Want to Do - http://techniquejunkies.com/things-i-want-to-do/ . There are a lot of fun verse in this set! Layers and layers and a glitter gel pen finish the card. Use this code to get 10% off your order! That is just great isn't it? From time to time, we all need to express our sympathy to our friends or to our extended family. I needed to send out three sympathy this week. Frequently I try to have sympathy cards on hand but I had run out of those. This is a relatively easy card to make. The stamp is from Inkadinkadoo. 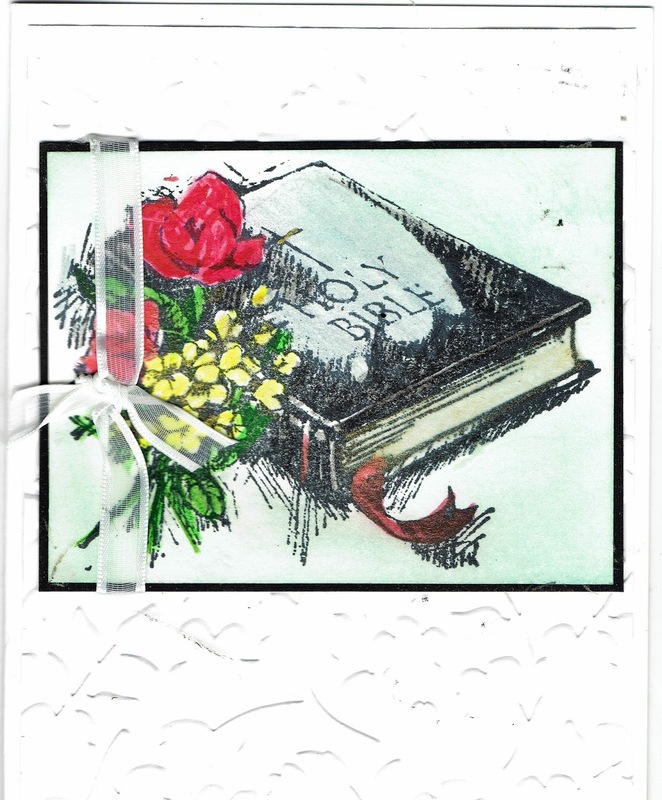 I used an embossing folder with flowers, and used that that the layer under the focal image. Then it was place on the white base card. I used Chamelon Colortone Pencils to color the image and on a few places I used some Smooch paints. I know we all watch technique videos - at least all of the stampers I know personally do. This weekend I watched a technique video with Ken Oliver using his Color Burst products. And I watched another video about using a "word" with interesting fonts to create a background. After that my mind began to whirl! Does that ever happen to you? I had company tonight for dinner so I couldn't act on what my mind was twirling around. But after they left I tidied up and then went to work on my what my mind was creating. I chose to use a Technique Junkies Palenttini stamp Life is a Canvas - http://techniquejunkies.com/life-is-a-canvas/ . I stamped in the middle of the card front and at an angle. I learned long ago that when you want to be sure that no one tell if something is stamped perfectly straight or not, it is best to stamp it at an angle. It helps to fool the eye and it adds visual interest to the card. So the entire background of the front panel is stamped with this stamp. So I chose one of the stencils from A Colorful Life - http://techniquejunkies.com/a-colorful-life-stencils/. I taped it down on scrap paper so it wouldn't move. I then spritzed it with four different colors of Color Burst over the stencil. Then I spritzed it all with water. Because the Color Burst was also on top of the stencil I didn't want to waste that beautiful color! So I laid another piece of white card stock on top of the stencil and covered it with a paper towel. So I now have a second piece of card stock to do something with. I carefully peeled back the stencil and there was an interesting colorful Chevron pattern over the words of the stamp. I thought it was cool! I felt this needed a focal image in top of this background , but what? I felt it needed to be sort of whimsical but what stamp to use? So I just started looking at the collection of individual stamps I have. I came across this giraffe called Stand Tall - http://techniquejunkies.com/stand-tall/ . I chose not to use the words on the stamp. I cut them off with a clean cut so I can insert them again on an acrylic block so I can use them when I want to do so. 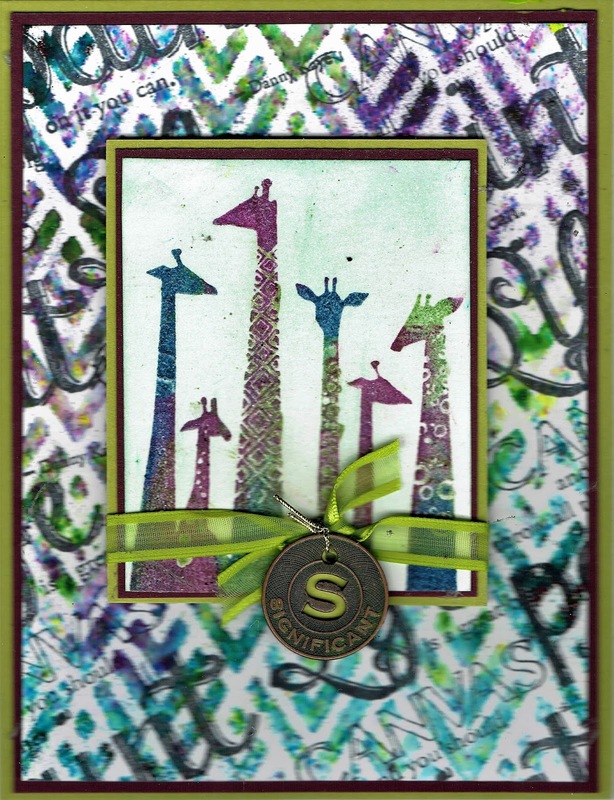 I first inked up the stamp with Versamark, then I tapped the stamp with colors here and there until all of the giraffes with inked up with a variety of colors - the colors are similar to what I used from the Color Burst through the stencil. Then because there was Versamark underneath the dye based ink I could cover it clear embossing powder and heat set -- so I did! 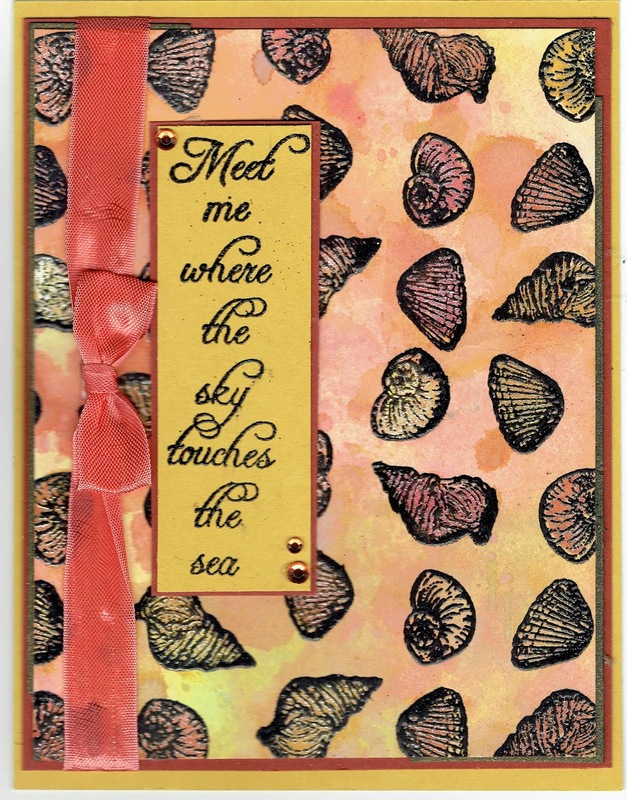 I loved seeing the vivid colors really "pop" with the heat embossing. The giraffe focal image is popped up with foam tape. Layers, a ribbon, and a tag embellishment finish the card. I hope you were challenged to do something new to you today. So Have a great day and get inky! I used two Technique Junkies July stamps for this card. I used Simply Shells for the background - http://techniquejunkies.com/simply-shells/ ; and Sky Touches the Sea - http://techniquejunkies.com/sky-touches-the-sea/ . 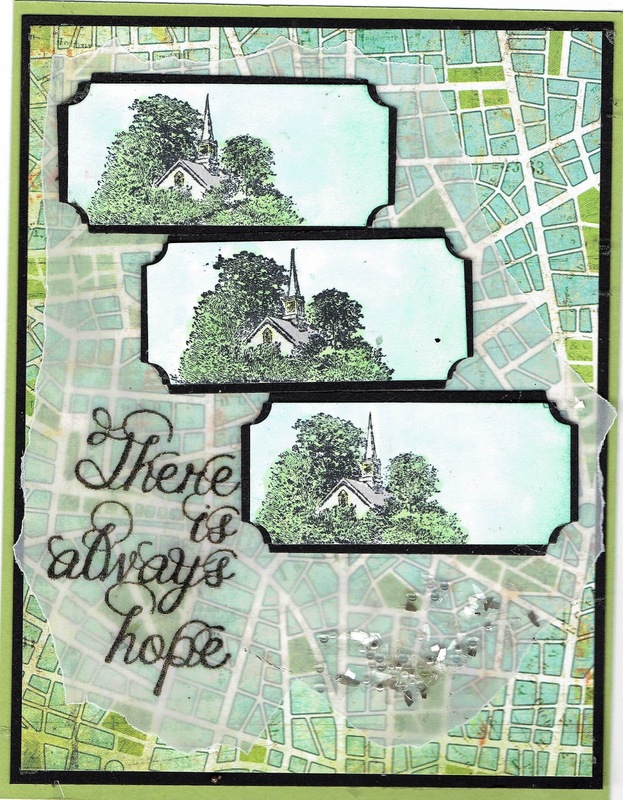 I made a background of Antique Glimmers, and used my MISTI - http://techniquejunkies.com/misti-most-incredible-stamping-tool-invented/ - as sometimes ink doesn't want to stick the Perfect Pearls part of the paper. Enough inking impressions does the trick. I then stamped the verse and heat embossed it. I layered on matching card stock to the others. Ribbon and pearls finish the card. I sometimes really like a smaller stamp. But the question always is, "How do you use a small stamp?" 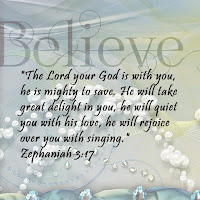 I really liked this image of this Little Church from Technique Junkies - .http://techniquejunkies.com/little-church/ . I stamped it three times and colored it in with my Copic markers. I used a ticket punch to punch it out, and used the same ticket punch to frame it. I punched out several tickets -- about 6 -- to cut in two and to fully frame the image. 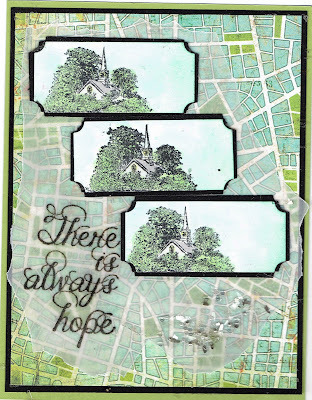 I used map backgrund paper and some torn vellum to tie together the Technique Junkies greeting - Always Hope - http://techniquejunkies.com/always-hope/ - and the three churches. The greeting was heat embossed with black ink and clear embossing powder. I drew some squiggly lines with Tombow glue and sprinkled some pretty mica flakes and beads that came all mixed together. This is a relatively card to create. I used a die cut, and sponged the sky and water on a small rectangle piece of white paper. I brushed some Wink of Stella over the sky to have the early evening stars shimmer. I used the Nuvo Glitter Markers and DOTTED - not brushed the color. I discovered that on dark areas when you brush the color on, it appears silver and not the color of shimmer you want. Then the scan doesn't show the color very well either. 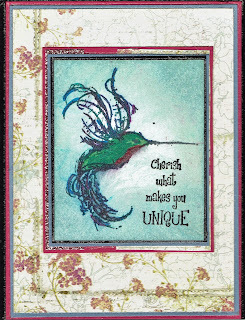 I used a Technique Junkies stamp from the Grand Greetings set - http://techniquejunkies.com/grand-greetings-set-of-5/ . 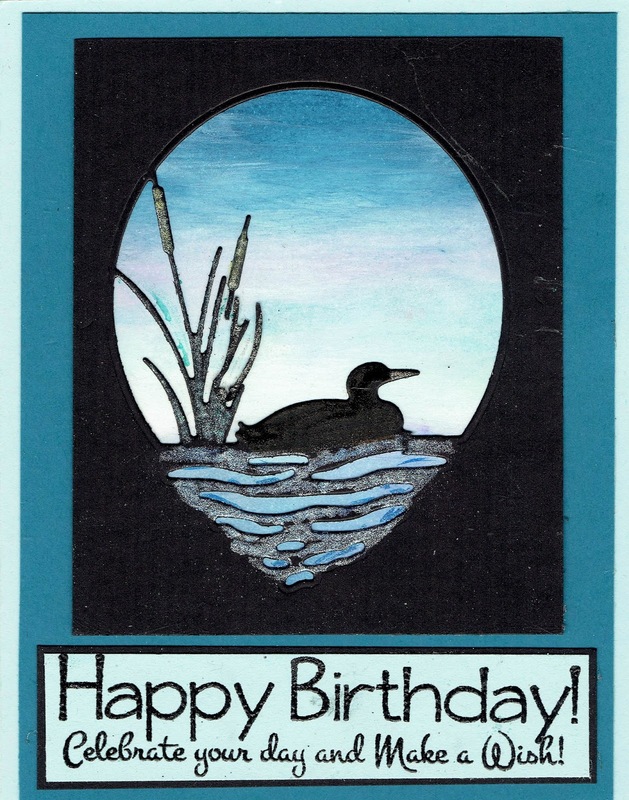 It is a lovely masculine card and easy to mail. Happy Birthday to my first granddaughter! At my local stamp club most of those in the group finished their card using the elements provided, but I chose to wait and a special fairy to her card. The words and the numbers are from Stampin' Up and the fairy is from Heather's Stamping Haven in Nepean, Ontario. Unfortunately, Heather closed that store several years ago. But I still have some of her wonderful stamps. My husband's parents were both born in Canada and immigrated to the United States many years ago, and became naturalized citizens of the USA. But there are a lot of cousins still in Canada and often we visited them for a family reunion. The cousin we stayed with was right near that small but delightful stamp store. I colored the fairy with Twinkling H2Os and then fussy cut her out. The Happy Birthday banner is adhered with foam take pieces to give give that "popped up" added dimension. 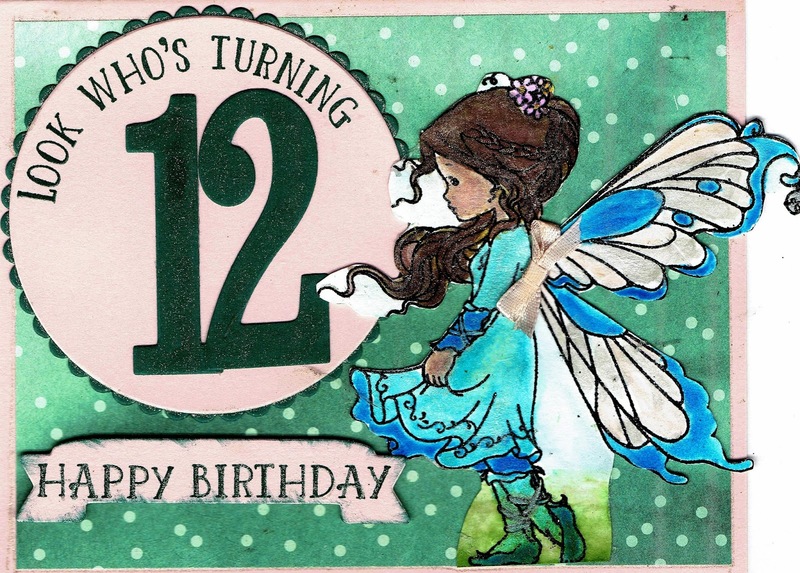 I tied a tiny pink bow and adhered to the wings with a tiny glue dot.n I hope she enjoys this card! I used a piece of card stock on which I had previously applied the Antique Glimmers technique. Then I used a MISTI tool (http://techniquejunkies.com/misti-most-incredible-stamping-tool-invented/) to stamp the Technique Junkies Palm Collage stamp (http://techniquejunkies.com/palm-collage/) a few times to get the best coverage over the background. 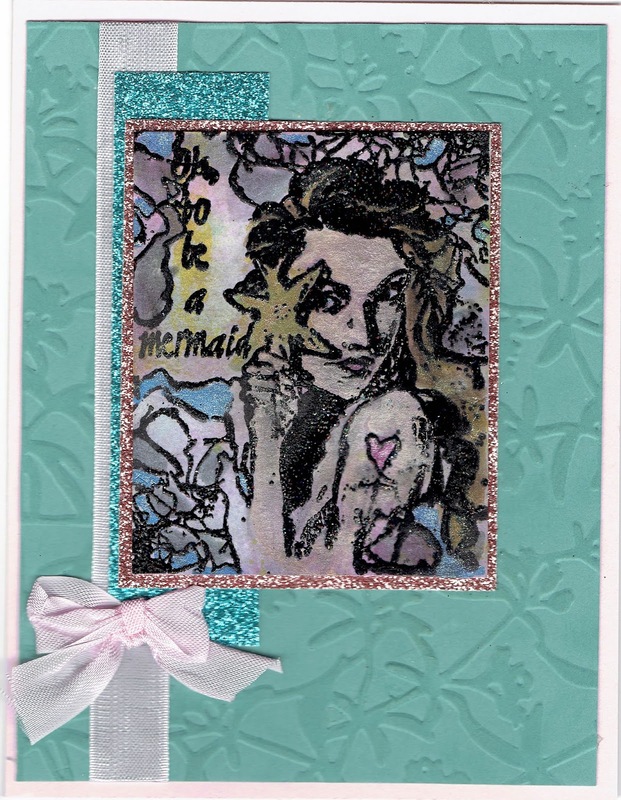 Then I heat embossed the image with black embossing powder that also has shimmery glitter included. To add color I used Twinkling H2Os, and Nuvo Glitter markers (http://techniquejunkies.com/nuvo-glitter-markers/) to add extra sparkle here and there. 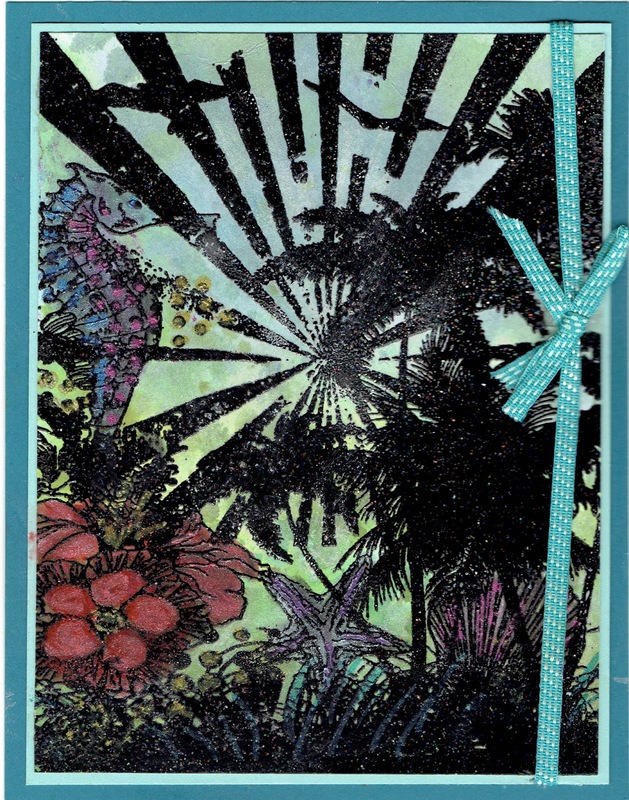 The hibiscus flowers in the bottom left corner are colored with the Nuvo glitter markers. Layers and a ribbon finish the card. Have a great sunny day, and get inky! 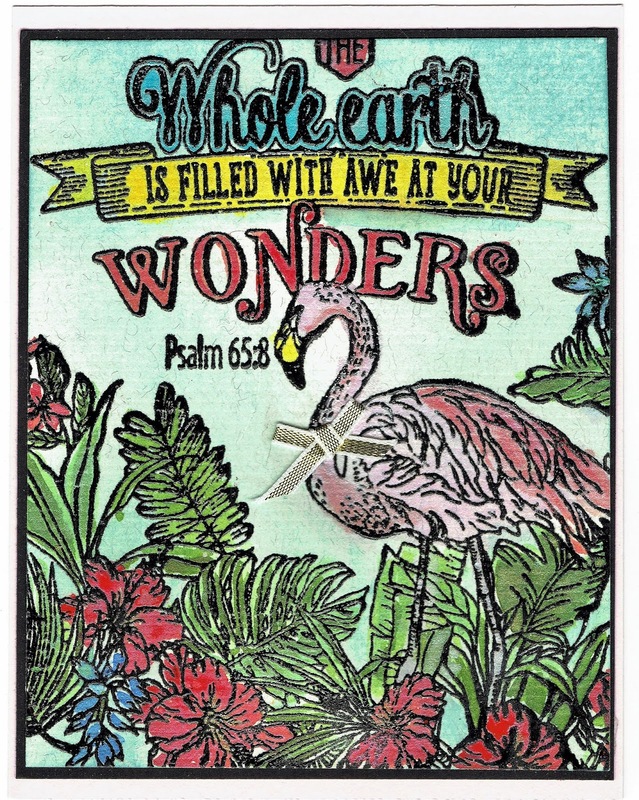 I created the background just about the base card with brown card stock and Technique Junkies Travel Documents stamp - http://techniquejunkies.com/travel-documents/ . 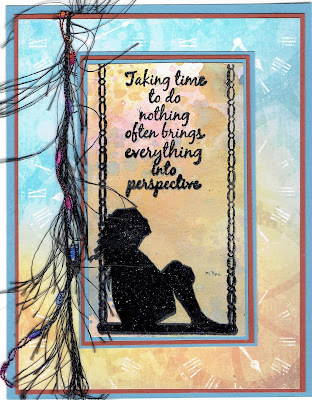 The focal image from the July release of Technique Junkie stamps called Perspective - www.techniquejunkies.com/perspective/ - is stamped on a v background created with Antique Glimmers technique. I used a Misti tool to stamp the focal image because I wanted to be sure that I had a clear dark image to emboss with detail black embossing powder. I have found that heat embossing words, letters, and fine lines it is good to emboss with clear embossing powder over a dark ink. But if you want to heat emboss a solid image it is best to emboss with black embossing powder of some type. I used burlap ribbons and stick on pearls for embellishments. And we all want to save money, right? You can get a 10% savings by using the coupon code TJ10Judy when you check out. I created a piece of card stock with various shades of blue with the Antique Glimmers technique. Then I stamped the Technique Junkies stamps Filled With Wonders - www.techniquejunkies.com/filled-with-wonders/ - from the July release. 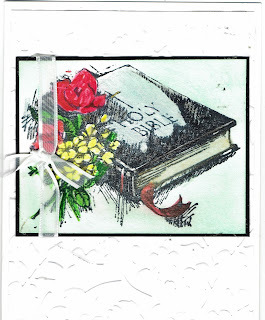 I heat embossed the image with black Versafine ink and clear embossing powder. I painted the image with Twinkling H2Os and I added some purple rhinestone bling to the banner. I highlighted different areas on the image Nuvo Glitter Marker - http://techniquejunkies.com/nuvo-glitter-markers/ . Please remember that all of the Technique Junkies Stamps July release stamps - www.techniquejunkies.com/july-2017-release/ - are on sale for 15% off through July 8 and this is the last day! The discount will be automatically applied at check out. All other products may be used with the code TJ10Judy and you will receive 10% off. 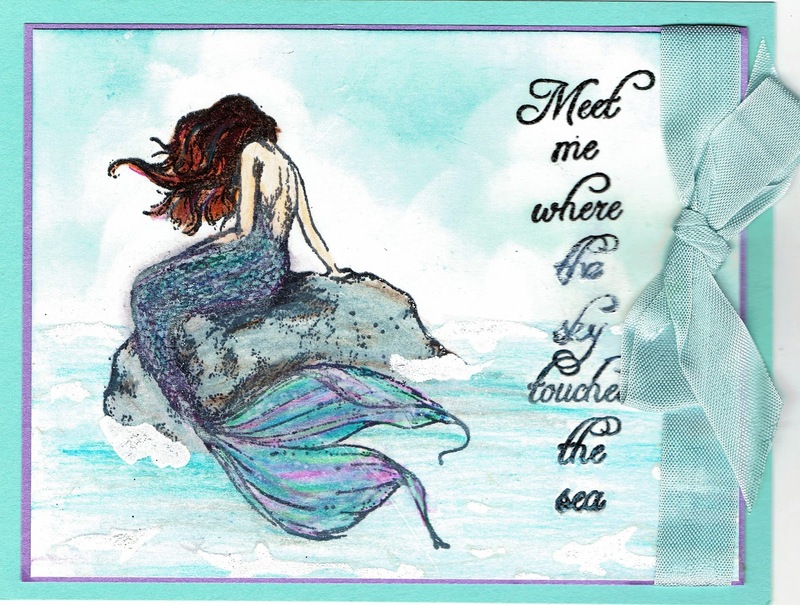 Oh to Be a Mermaid! To create this card with this lovely Technique Junkies stamps Be a Mermaid - www.techniquejunkies.com/be-a-mermaid/ - I used a piece of scrap card stock that had been treated with the Antique Glimmers technique. 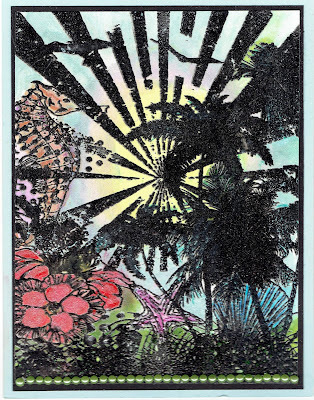 I stamped the image with Memento black, and colored in the image with Chameleon Colortone Pencils - http://techniquejunkies.com/chameleon-colortone-pencils/ . I highlighted certain areas with Nuvo Glitter Pens - http://techniquejunkies.com/nuvo-glitter-markers/ . 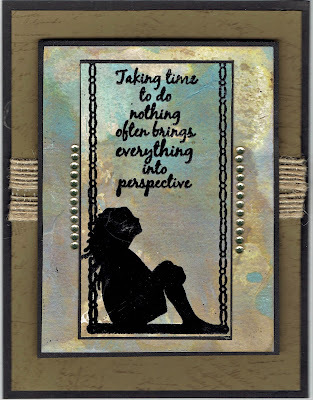 Then I used an embossing folder with the panel behind the focal image. I hightlighted the embossed areas with a stiff sponge. Ribbons and glitter paper finish my project. Please remember that all of the Technique Junkies Stamps July release stamps - www.techniquejunkies.com/july-2017-release/ - are on sale for 15% off through July 8. The discount will be automatically applied at check out. 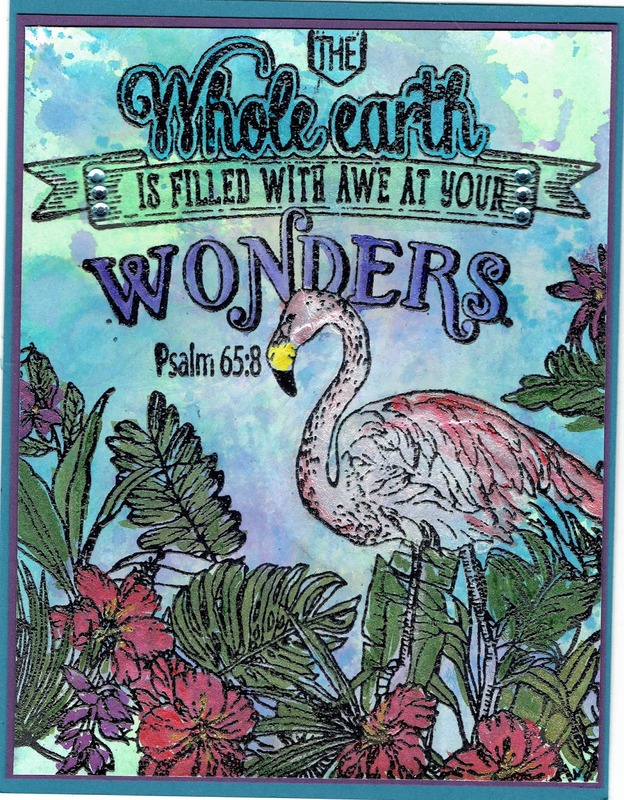 Have a wonderful stamping day and get inky! to color her in. I also used the pencils to color in the water. I added a bit of glimmer with a glitter gel pen and smeared the glitter around with my trusty finger tip! I used a homemade stencil to sponge in the clouds. And then I decided to a touch of white embossing powder over a tiny bit of glue for the white caps on the waves. The verse is a Technique Junkies Stamps July release called Sky Touches the Sea - www.techniquejunkies.com/sky-touches-the-sea/ . It was heat embossed. Please remember the newly released Technique Junkies Stamps for July are on sale 15% off through July 8. The discount will be taken off automatically. 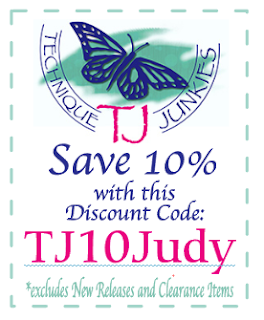 And to remind you all other items in the Technique Junkie store can have a 10% discount if you use the discount code TJ10Judy. Happy July! New Stamps! New Fun! New Cards! And a Blog Hop! Every month the Technique Junkie Design Team gets new stamps for the next month's new stamp releases. We often get them several weeks in advance of the new release. 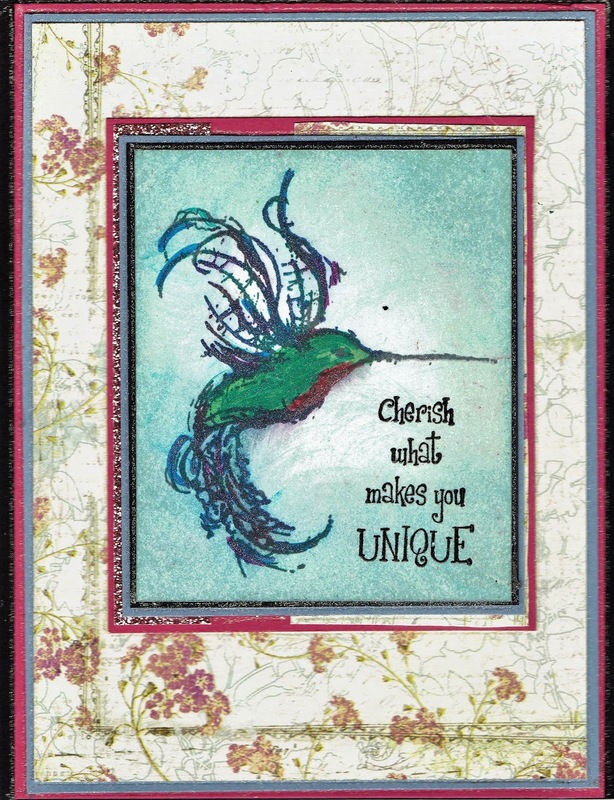 That is so we can work up new cards and other new projects in time for the big reveal blog hop the first of the month. This is always exciting for us. And we get to play before they are publicly seen. Whoo-hoo! So this day has the first reveal. 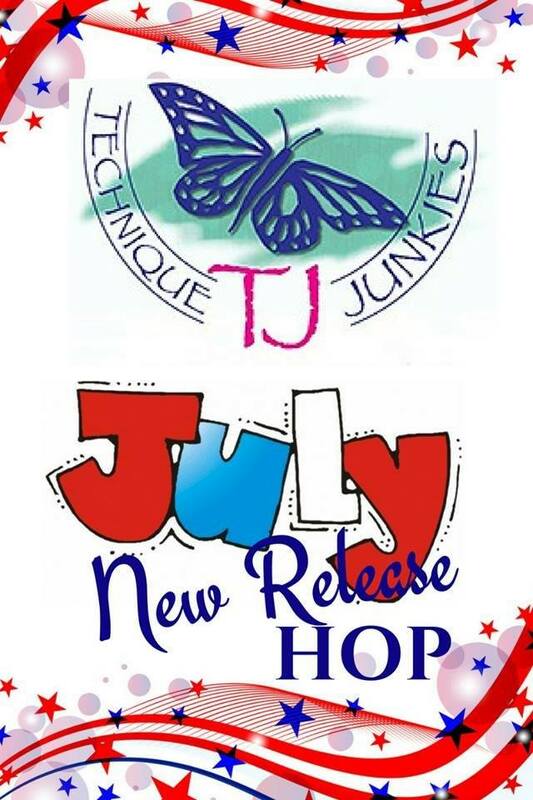 And the entire July Release of Technique Junkie Stamps can be seen here - www.techniquejunkies.com/july-2017-release/. The Technique Junkie new release blog hop always starts with the Design Team blog - http://techniquejunkies.blogspot.com/ and you should have arrived to my blog from . 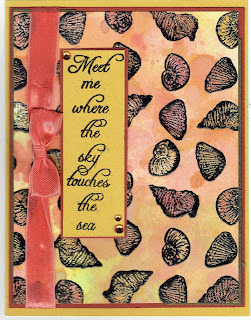 My first card uses two new Technique Junkies Stamps - Be A Mermaid - www.techniquejunkies.com/be-a-mermaid/ - and Simply Shells - www.techniquejunkies.com/simply-shells/. I used a piece of card stock and applied the Antique Glimmers technique to create the color. Then I stamped the shells with a smoky gray ink. 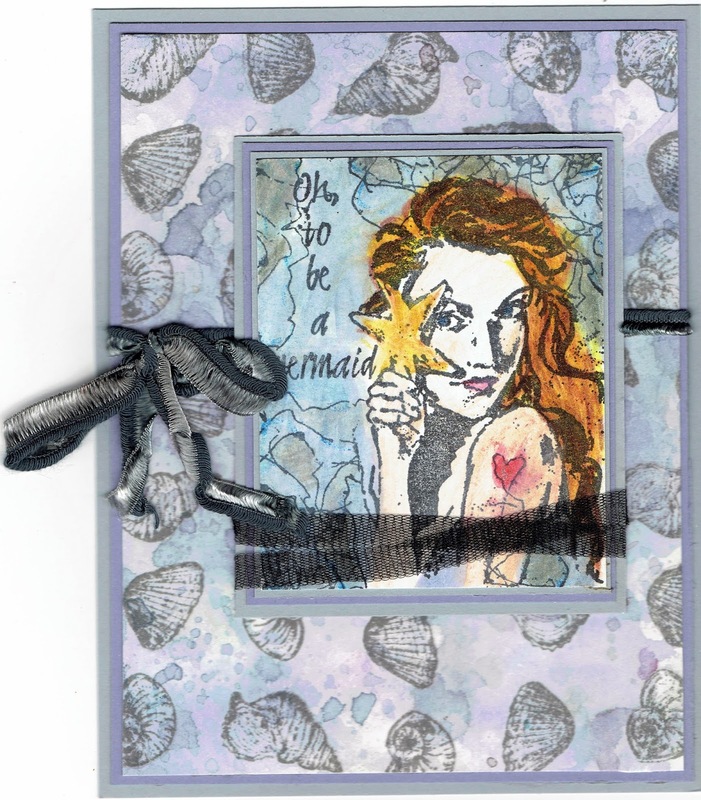 The mermaid stamp was stamped in black Memento ink and colored in with Chameleon Colortone Pencils - http://techniquejunkies.com/chameleon-colortone-pencils/ . Her hair and the star were highlighted with Twinkling H2Os. Then I used the same Distress Inks I used for background and watercolored the background, adding some other colors with the Chameleon pencils. I used the new Nuvo G;litter Markers to color the heart. Layers and ribbons finish my card. This card features a new Technique Junkies stamp that is just fun to color! It is called Filled With Wonders - www.techniquejunkies.com/filled-with-wonders/ . I used Twinkling H2Os to color all of these details. I tied a tiny gold bow on the flamingo's neck. And did you know flamingos have red feathers on their back? I didn't either! I googled for a picture to find out for sure just what colors I should use. I also discovered that the reason for their pink and reddish feathers is from their diet -- of a certain type of shrimp. When baby flamingos hatch their feathers are gray -- no pink at all! I used a scrap of card stock with Antique Glimmers and used my MISTI - http://techniquejunkies.com/misti-most-incredible-stamping-tool-invented/ - to be sure I was getting a sharp clear image to heat emboss. I had to reink my stamp about 2-3 times. I must not have been putting enough pressure or something. But the MISTI solves the problem! 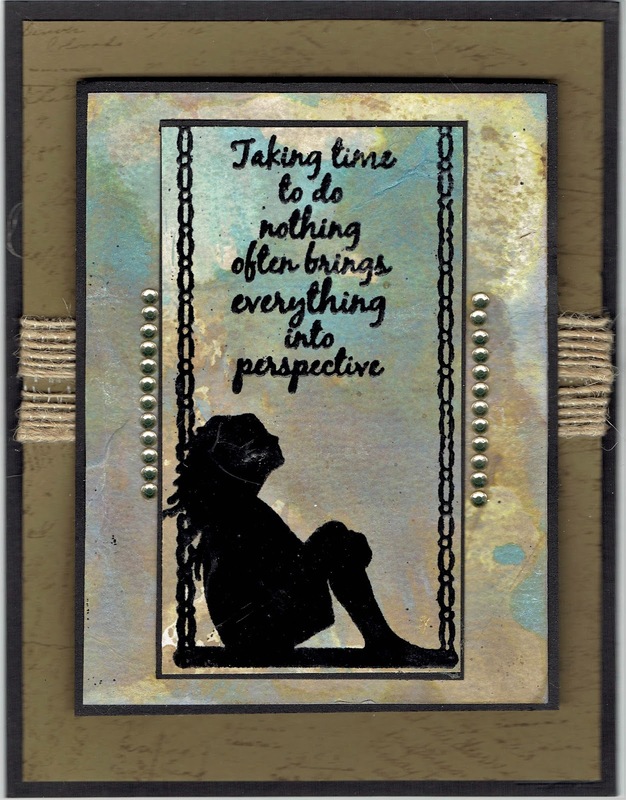 I used black embossing powder with just a bit of sparkle in it and heat set. Then in my stash, I found this delightful clock background paper that matches the colors used in the Antique Glimmers technique, It just was perfect with this new Technique Junkies stamp Perspective - www.techniquejunkies.com/perspective/. 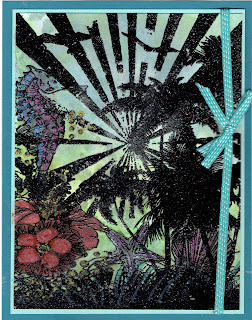 My last card uses the new Technique Junkies Stamp called Palm Collage - www.techniquejunkies.com/palm-collage/. I used the MISTI to stamp it and it worked well to ensure I got a good crisp image to emboss with plain black embossing powder. To add the details in the coloring I did several things. First I took a sponge with yellow ink and swirled it around the center where I imagined the sun was shining. Then I added a bit of pink ink around the yellow, and finished with a light blue ink all around the rest of the card. I painted the seahorse, the flowers, the starfish,the grass, and the shell with Twinkling H2Os, But then I went over the flowers, part of the starfish, part of the shell, a few of the palm leaves, and some of the dots with the Nuvo Glitter Markers to add highlights of color here and there. The marker ink really helped to give a shimmery pop of color! As always the newly released Technique Junkies Stamps for July are on sale 15% off through July 8. The discount will be taken off automatically. And to remind you all other items in the Technique Junkie store can have a 10% discount if you use the discount code TJ10Judy. will have wonderful cards for you to see next after me! Technique Junkies has some truly gifted artists on the Design Team. And don't forget, there is 15% off of all the July Release Technique Junkies Stamps until July 8, 2017! And you can get an additional 10% off everything else with the code TJ10Judy! Have a great day and be sure you get inky!